Reznor’s V3 Series UDAP high efficiency heaters are excellent for space heating applications. These gas-fired unit heaters are power vented in order to eliminate heat losses up the flue pipe. Power vented models have a higher initial cost than similar “gravity” vented models, but will save money on fuel costs. UDAP heaters are designed for 82-83% thermal efficiency often meeting utility company thresholds for rebate incentives. All Reznor V3 series heaters are CSA Design Certified, and have a refreshing appearance with a glossy white cabinet finish. 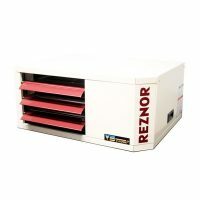 Reznor’s V3 Series UDAS gas-fired separated combustion unit heaters are available in 14 sizes ranging from 30,000 to 400,000 BTUH gas input (Sizes 30-125 are approved for residential application). Model UDAS heaters are designed for 82-83% thermal efficiency and are approved for installation in the United States and Canada by the Canadian Standards Association (CSA). 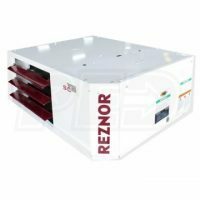 The first ever separated combustion system in the commercial/industrial heating industry was introduced on a Reznor heater in the 1960’s, and that proven technology is continued in this new separated combustion product. Model UDAS separated combustion units require installation of a specially designed combustion air/vent system including the unique concentric adapter box that allows for only one building penetration for both the vent and combustion air. Superior Radiant Products (SRP®) is an industry leader in the design and manufacture of energy efficient infrared heating solutions and is dedicated to providing superior technology and superior performance. Roberts Gordon has been manufacturing infrared tube heaters since the early 1960s and is the industry leader in radiant efficiency. Approved for residential garages and light commercial applications, Caribe® infrared heaters are the easiest to order, install and appreciate. Each heater is factory assembled with a compact u-tube design that delivers maximum inputs at minimum tube lengths. This infrared heater is engineered with a balanced flue preventing the need for multiple building penetrations. Exhaust and combustion air are able to exit and enter at the same location courtesy of concentric vent tubing. After your residential infrared heating unit is easily installed, included 24 volt dual scale thermostat can be connected for immediate operation. With infrared heater installed horizontally or tilted at a 45 degree angle, the deep-dish reflector properly directs infrared heat to desired areas. Low clearances to combustibles allow infrared tube heaters to be installed in residential garages and workshops. Additionally, lobby areas, entrance ways and public garages are prefect applications for this compact and residential infrared heater. Vantage® NP negative pressure infrared heaters deliver custom, efficient heating options without the custom price tag. Multi-burner heater layout allows for up to 16 burners per system, covering 1.6 million Btu/h. Heaters are also available in unitary configuration, but utilizing multi-burner systems reduces building penetrations and installation cost pairing multiple burners per pump. Various zoning options based on controller type are available. Basic operation allows up to two zones, but this controller will not provide feedback on operating conditions or prompt system to post-purge products of combustion from the system. Alternatively, the System Control allows up to four zones and provides operating feedback conditions. Feedback conditions include power indication for pump and zones with pressure switch and lights. Lastly, added safety and piece of mind, System Control includes two minute post purge, allowing products of combustion to be exhausted outside the building. Roberts Gordon® Compact™ DF-Series infrared tube heater sets itself apart from all the others by offering two-stage technology. This allows the heater to efficiently adjust to sudden high-heat loss conditions. As we already know, radiant heaters economically maintain high comfort levels at low air temperatures. With dual firing rates, quick heat recovery can be captured. Similar to the entire infrared heater product line, the Compact™ DF heater is produced at the same industry high standards. Typical installations are for commercial and industrial applications. Standard product features include dual burner status indicator lights and convenient external thermostat connection to power a low voltage thermostat. This infrared heater, similar to many others, offers a hinged burner box door providing easy access to electrical components. With quick service and maintenance in mind, the burner box has an internal partition separating combustion air from the electrical components. Like our other unitary infrared heaters, the Compact™ DF has flexible layout options that include straight, u-tube, or “L” configurations along with a broad range of burner sizes and tube lengths.